First prepare the crust. Sprinkle the yeast over the warm water and leave for a few minutes. In a large bowl mix together the flour, salt, ⅓ cup olive oil and honey. Add the yeast water and mix until just combined and the dough pulls away from the sides. If it is too sticky, add 1 tablespoon of flour extra at a time until it pulls away from the bowl. Grease a large bowl with olive oil and place the dough inside, turning a few times to coat in the oil. Cover the bowl with cling wrap and leave to rest for 1 to 2 hours until needed, or up to 2 days in the refrigerator. When you are ready to make the pizzas, dice then cook the chicken. Preheat the oven to 450F and spray the pizza trays with cooking spray. 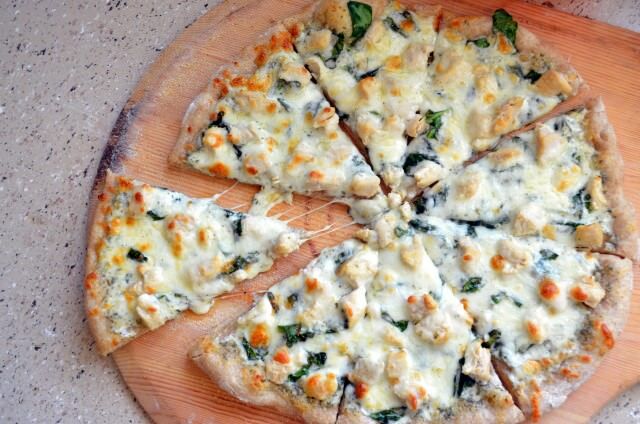 Divide the dough into four even pieces and roll and shape to the size of the pizza trays. Rub a bit of olive oil and sprinkle some added salt on the pizza tops. Mix the alfredo sauce and garlic together well. Top each pizza evenly with the alfredo sauce, chicken pieces, bacon and cheese. Bake the pizza for about 10 to 15 minutes or until the cheese is bubbling and the crust is golden.